Why you may ask would several Master Gardeners be spray painting dried agapanthus, hydrangeas, sedum, and so much more in the rain and wind? 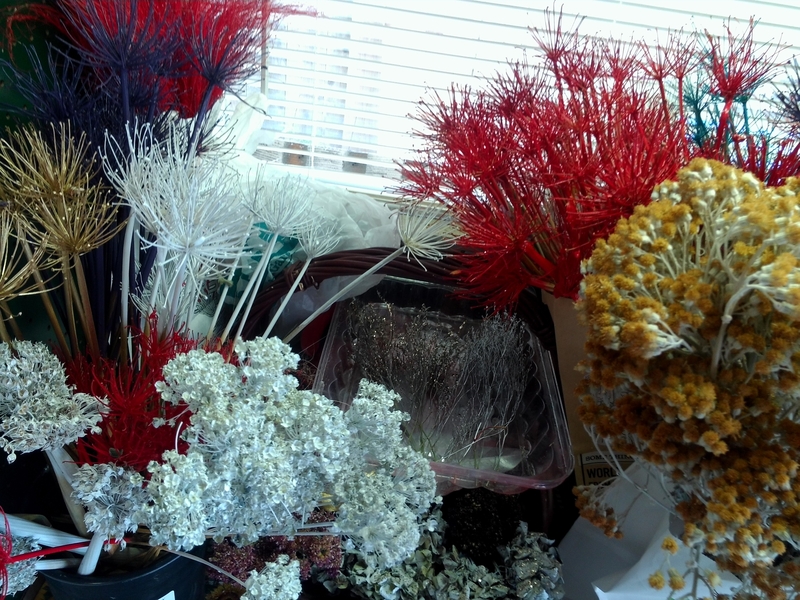 Well there is a simple answer; the Master Gardener’s 19th annual Wreath Workshop is just around the corner. We are getting things ready so that you can participate in making a beautiful wreath for your home, what better way to start the holiday season? To do this, we start by drying some plants we have grown in our gardens. The dried foliage and flowers that look good get to stay their natural color when dried. The not-so-good looking dried materials get spray painted different colors. In addition to the materials mentioned, we also have magnolia leaves, Deodora cones, statice, as well as other plants. 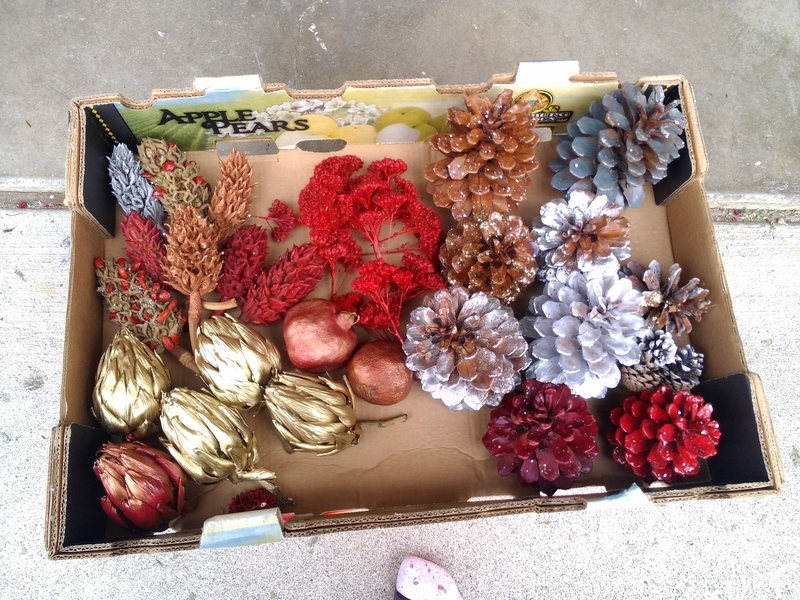 The pine cones are of various sizes and we have been painting them to look like they have been dusted by snow. There will be ribbon in a multitude of colors for bows. Prior to the actual date of the Wreath Workshop, which is December 7, 2013; Master Gardeners will spend 3 days gathering greens. They will then cut materials to a size that is manageable for wreath making, and finally, boxing them. In this box of foliage you might also find in addition to the redwood, some lavender or rosemary. If you have never attending this Wreath Workshop, this is what you can expect to get for the fee that you will pay: a banana box filled with greenery, a wire wreath frame, paddle wire and all sorts of natural decorations and a bow. Refreshments will be served throughout the event. There will be Master Gardeners to help if you need a refresher on how to make a wreath. You can also call Jennifer Baumbach at 707-784-1321 for addition information. Gardens in Schools? What a Concept! This past year I was involved with a process in Vallejo called “Participatory Budgeting”. A mouthful which basically means, we citizens got to participate in how a small portion of the City’s budget is spent. Specifically, this small portion is a percentage of the larger Measure B tax that we voted on a few years ago – we voted to tax ourselves, 1¢ of every $1 spent. What a good idea that we get to have a say in how at least part of it is spent! And one project that was proposed for some of this money to be spent on, voted on by citizens and approved by the City, was enhancing current community gardens and creating new ones. Does everyone know about this? As citizens of Vallejo you absolutely should! As citizens of Solano County it would be nice if you did, even though it doesn’t necessarily impact you directly. But as Master Gardeners, we should ALL be aware of this great accomplishment – getting funds directed toward enhancing and creating more gardens in the community! However, the challenge now is, how does this get implemented? That will be a long and somewhat tedious process no doubt and every garden that will be enhanced or created will be a wonderful thing. However, my original thought when I first heard about this project was putting these gardens in schools. 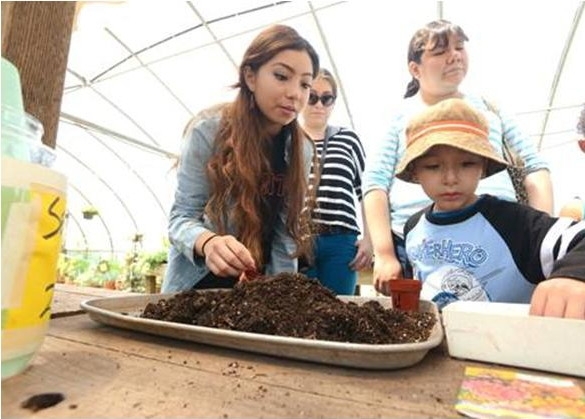 Not only would it teach children very valuable lessons, but if the gardens could grow to have a significant yield, they could provide food for school lunches! There are a variety of benefits that could come from creating gardens in schools, but it always comes down to funding. 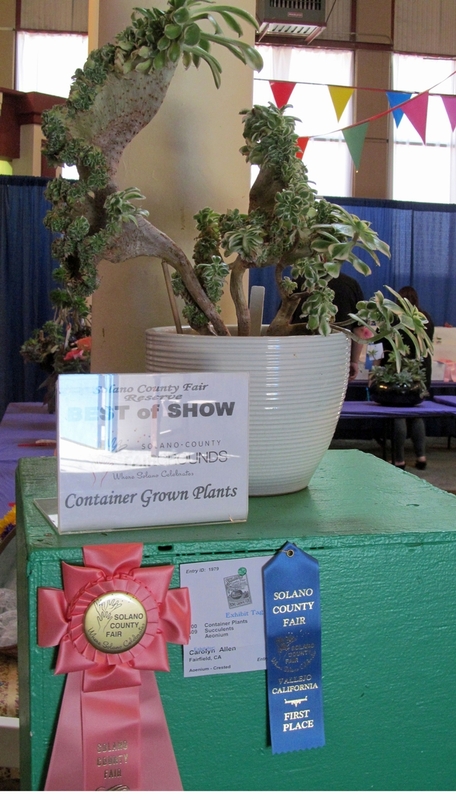 If you missed it, the Solano County Fair ran from July 31 to August 4. 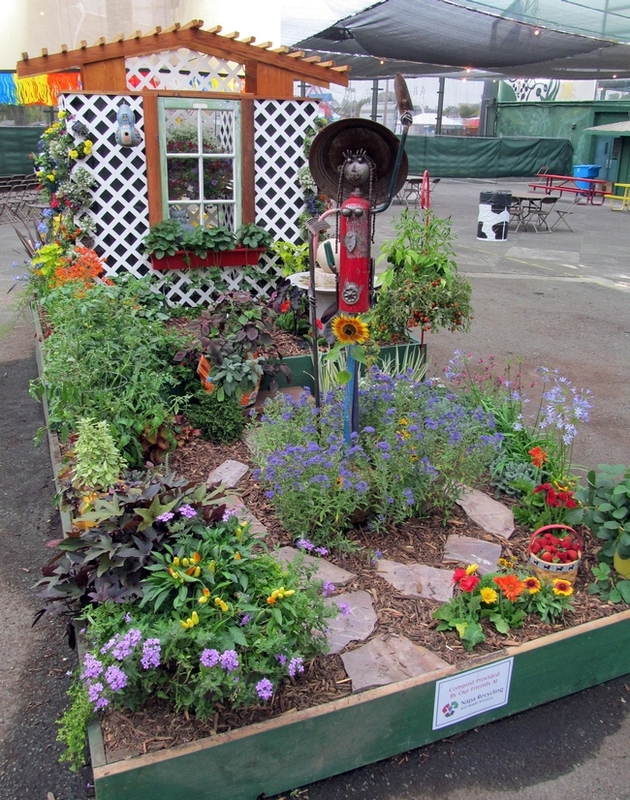 It's been about 5 years now that the UC Master Gardeners have participated in the Amateur Gardens competition at the fair. The first year, they did not enter the garden competition. However, for the past four years, they have won blue ribbons (yes, I'm bragging about it here!). The Master Gardeners are not professional gardeners, they are people who just love to garden and share their knowledge with others. The theme this year was "Home Grown Fun", so they create a house façade and planted a colorful variety of plants around it. 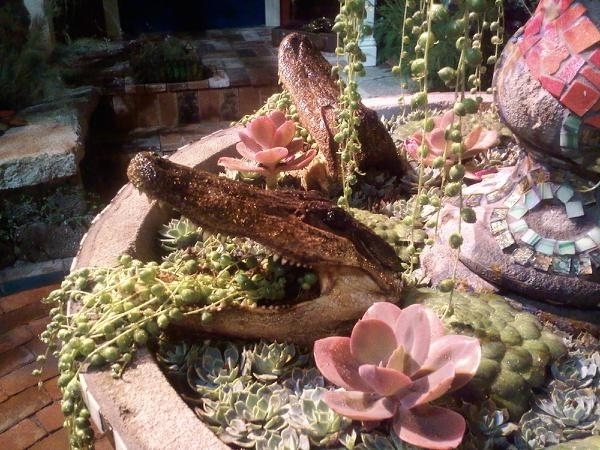 They embellished the garden with whimsy, such as a metal sculpture, a gourd, a fun chicken planter and a cat peeking out the window. 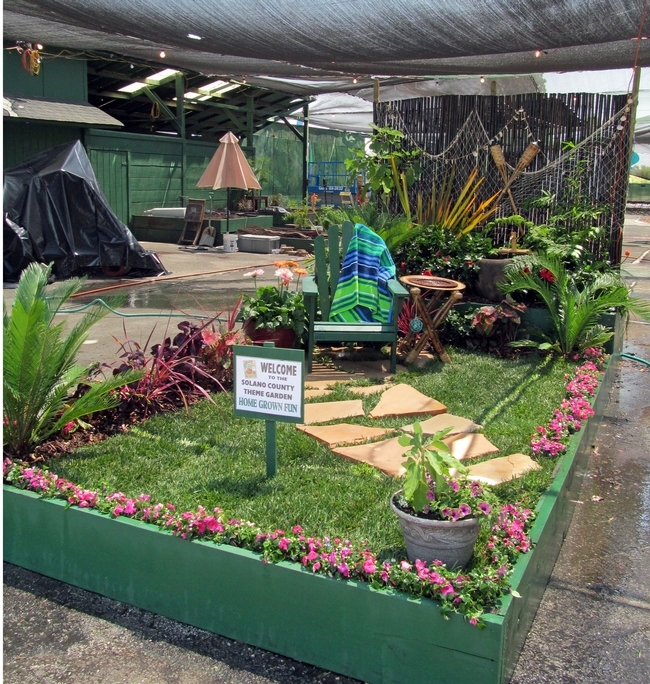 The MGs create a non-competition garden for the entryway to these competition gardens within the Twilight Theater. This garden had a tropical, relaxing vibe to it. In addition to the gardens, we some times have MGs who enter their own plants in the plant or flower competitions as well. Karen Pryor used to enter this fabulous shrimp (Justicia brandegeana) plant year after year. It was gorgeous! This year MG Carolyn Allen entered her crested aeonium. It's crazy, weird appearance caught the eye of many an onlooker and the judges. She placed Reserve Best of Show in the Container Grown Plants. 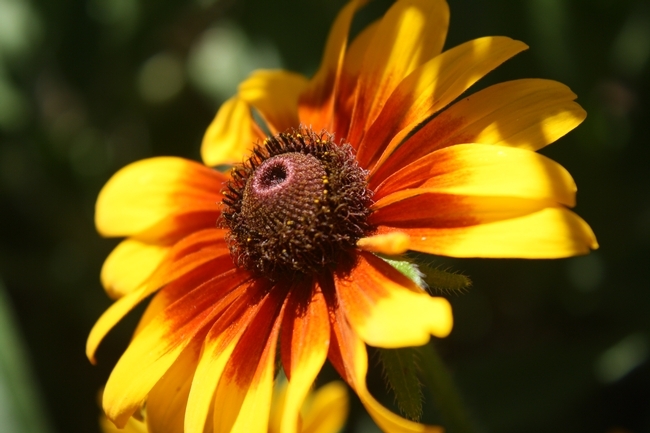 Congratulations to the UC Master Gardeners in Solano County! A wonderful group of gardeners!